"Why is it that you never forget your first love? Maybe it’s because it’s the first person you gave your heart to, completely. The first time you were afraid to breathe for fear the moment would pass and you would miss some of the seconds. Life is seldom what we think it will be. Especially when you’re seventeen and the biggest concern you have is whether someone has the same prom dress." I've known Buffy for eight or nine years now, and in that time she's written, by my rough estimate, about 800,000 books -- mostly middle grade and young adult fiction. This is on top of her full-time gig as the Assistant Managing Editors for Features and Niche Publications at the York Daily Record, raising two kids, running her church charity auction, golfing, finding complementary Glade fragrances for each room of her house, shopping at Kohls and maintaing active profiles on just about every social media tool that has ever been invented. She's a busy lady. For years, she's been sending out query letters in search of an agent who could help her get published (she often told me that could be another full-time job). And she's experienced a lot of frustration and heartache -- expressing to me, at times, that she didn't think she'd ever get published. And I always told her that she would. She's a disciplined, talented, not to mention prolific writer, who sets her sights on a goal and by sheer will and determination, achieves that goal. That's just the person she is. To me, her getting published was a foregone conclusion, it was only a matter of when. Fast forward to this past month, when I've seen Facebook update after Facebook update from her that several of the novels she's written are being picked up for publication -- and by several I mean five. Five books! I'm so proud of her. Also, I told you so. I haven't read "Gina & Mike" yet, though it's next on my list (I promise Buffy!). Buffy and other writing acquaintances like Megan Erickson (who just had a second kid this year and is working on her second novel ... redonks!) are giving me hope that I, too, will some day overcome my mental writing barriers. Which is good, because my neighbor just informed me that she's been hoarding all the cards and notes I send her way (I'm a thank you note writer -- and she's someone I frequently have the privilege of thanking) so that when I'm a famous author she'll be able to say she knew me when. So now I have to finish the book if for no other reason then to ensure she doesn't amass years' worth of paper clutter for no reason. Also, I informed her that I'd ever reach a point in my career that she wouldn't be able to, you know, just call me. From my mom: "Just heard about an author of 19 books who died today-- he published his FIRST book when he was 60! You will make it. Love mom"
From my sister Laura: "8,000 words is a lot on one subject, something that requires a constant battling of ADD tendencies unlike a blog which is perfect for this day, age, and place you are at in life. I say this as I blink my eyes as the front door slams shaking the whole house....it would take a divine concentration or an extremely detached personality to make better progress, me thinks. I am proud of you for hanging on so tenaciously to your dream. I am utterly, completely convinced that it is that attribute that makes the difference between people who produce things and those who don’t. It really is truth. Mrs. Producer pants!" And my sister Sarah in just about every conversation we have is offering up ideas for new books I should write or we should co-author -- the latest of which is a biography of our dad as told from our perspective -- sitting in the backseat of the crumb-encrusted family van sipping warm sodas and listening to "Jonathan Livingston Seagull" on audiobook on summer road trips that seemed to last anywhere from a week to eternity. It might be a skosh biased. I really do have the best cheerleaders. In talking about his childhood, Whedon said the rule in the house was that between breakfast and lunch he and his brothers weren't allowed to make a sound -- quiet time was required so his mom could write. I don't think that I could ever be the sort of mom who could demand and enforce complete silence in my household for several hours a day so that I could pursue my dreams. We all know how much success I've had at trying to stop the dog from barking every time the oak tree in our backyard twitches with the promise of squirrels. Asking children who seem naturally inclined to noisiness to not make noise is like asking Brad not to comment about how lovely the Duchess of Cambridge is every time he sees a picture of her. It's just not going to happen. And that's OK with me. I think I'm OK putting off my wild dreams during between the hours of breakfast and lunch, so long as I get them back in the hours after dinner. 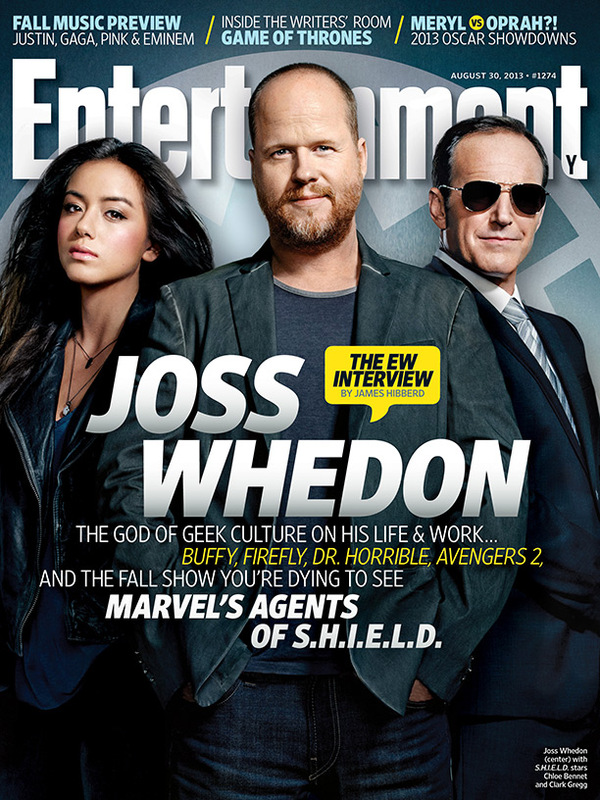 I don't mean to sound judgmental of Whedon's mother. Certainly her writing pursuits have paid off big dividends in his writing pursuits. What did he do during quiet time? "You're either writing or you're eating or you're walking up and down the driveway creating giant science-fiction universes and various elaborate vengeance schemes upon your brothers." On letting your story be your guide: "Somebody once asked me if I have anything like faith, and I said I have faith in the narrative. I have a belief in a narrative that is bigger than me, that is alive and I trust will work itself out." 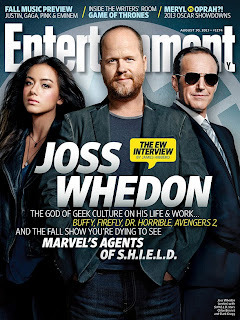 Thank you Joss Whedon. I think a big part of my resistance to fiction is fear that I don't know where it's going. But just as with life (and George Michael classics), you gotta have faith. On writing about hope ... even if you don't have any yourself: After telling the interviewer that he honestly doesn't have hope for the future of humanity or the planet, Whedon explained why despite those beliefs, his storytelling isn't bleak: "My stories do have hope because that is one of the things that is part of the solution -- if there can be one. We use stories to connect, to care about people, to care about a situation. To turn the mundane heroic, to make people really thing about who they are." And thank you again, Joss Whedon, for reminding me about why I even try.